Walking through Dublin Castle or along the surviving medieval city walls, you can see only glimpses of what it would have been like to live in the city centuries ago. 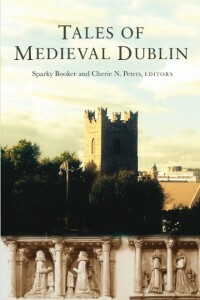 Tales of medieval Dublin provides a chance for modern audiences to meet the Irish, Norse and English men and women who lived in this colourful medieval city, and to hear their fascinating stories. While providing the most up-to-date research, these fourteen tales are written to appeal to anyone interested in the city’s past. They span almost 1,000 years of Dublin’s history and trace the lives of warriors, churchmen, queens, bards and barons, as well as those individuals who are so often ignored in the historical record, like housewives, tax collectors, masons, lawyers, notaries, peasants and slaves. This volume serves both as a history of the medieval city, and as a window into the day-to-day lives of the men and women who lived there.